This May, I had the wonderful opportunity to visit Universal Studios in Orlando, Florida as part of my multi-city vacation. Of the three full days I had here, two were spent at Universal. While Universal Studios has a nice mixture of theme parks for adults and children, my main reason to visit it was the Wizarding World of Harry Potter which had been my dream since it was first opened. I had booked a room at the La Quinta Inn which was a five minute drive from Universal itself and definitely a time saver in terms of travelling. I had not bought the actual Universal park tickets online (which are supposed to be a bit cheaper than buying them in the park). However, the hotel had a discount package which the concierge helped me with and I was able to get a these tickets cheaper which helped me save up some money to actually spend inside the park. Universal is split into three main parks that each need a ticket; Universal Studios Florida, Universal’s Island of Adventures and Universal’s Volcano Bay. The my first day I visited Universal Studios Florida which had Diagon Alley, a classic Harry Potter landmark, at the end. As soon as I entered the park, I headed straight for Diagon Alley and it was a bit of a walk given that it was at the end but I had come prepared with the appropriate shoes and gear knowing it would be a long day of walking. Finding the actual attraction was easy because there are signs at almost every other block or after an attraction pointing you towards your desired destination. Tip- Given that there were a couple other hotels nearby too, it is a nice idea to book a hotel room somewhere close by if you do not have a car (which I didn’t) are not keen on spending a lot on taxi. I was able to get the room at fairly reasonable price having booked it several months ahead of time. While looking into park tickets for Universal, I would suggest asking the hotel itself if they had any special offers available which in many cases is cheaper than buying them at the park itself. Upon entering, it was easy to be overwhelmed by the number of stores they actually had because they made it an exact replica from the movies with all the major shops and places mentioned in the books as well. Entering this place the first thing that you notice are the different soundtracks that keep playing, giving you a realistic experience of being in the Harry Potter Universe. Butterbeer: Given that this is the most hyped drink in the franchise, it was also the first thing I tried. Since it was May, they had Butterbeer available either frozen or cold and I opted for the cold one. Butterbeer itself was a non-alcoholic drink (despite it’s name) and a really refreshing and smooth drink after a long walk to reach Diagon Alley. 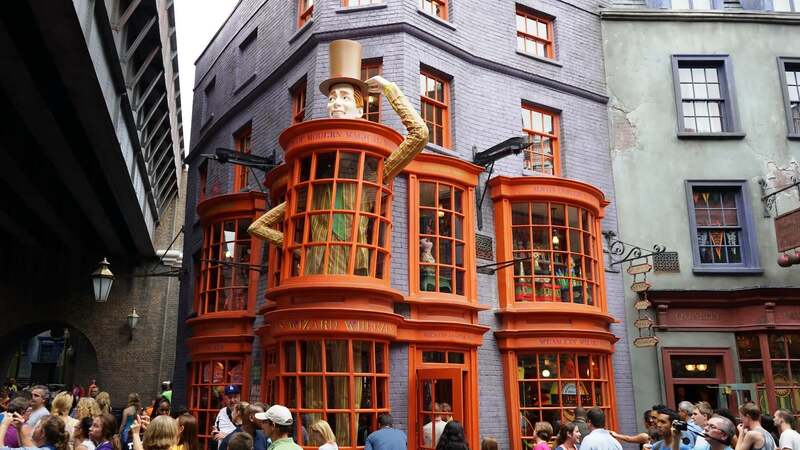 Weasley’s Wizard Wheezes: The shop was located right next to the entrance of Diagon Alley, where I got my Butterbeer from and you could actually enter the shop to buy your own prank items! The shop was sized exactly like the movies and you could find most of the popular Weasley’s Wizard Wheezes items mentioned in the books. This was interesting because you get to see a real non-magic world interpretation of the items. 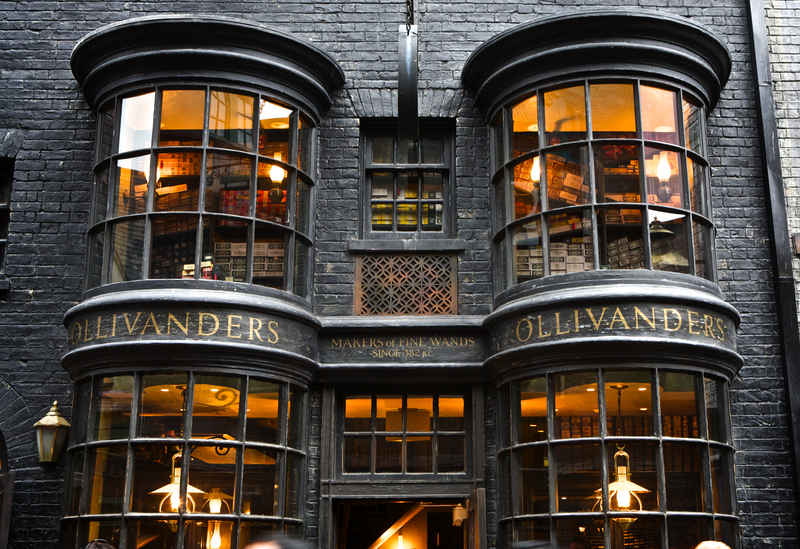 Ollivander’s: The shop was a bit bigger than what they actually showed in the movies, but they had every shelf stacked from top to bottom with wand boxes and a lot of the customers were enthusiastically walking around buying different wands. The Leaky Cauldron: After roaming about and visiting the several shops all over Diagon Alley, I decided to eat my lunch here. I went in around 1 pm and while the queue was long, we did get a table almost immediately after putting in our order. We ended up ordering the Fish and Chips (a classic!) and the Specialty Chicken sandwich. The food was delicious and came to the table pretty soon after ordering too. The entire setting of the place was a bit more classy than what was described in the book which definitely made the dining experience enjoyable. They did have displays or corridors and stairs leading upstairs to where the rooms were supposed to be in the books. Tip- I’d recommend not waiting till a later lunch time if you plan to dine either here or at the Three Broomsticks (they have a similar menu) since the wait for tables get a bit longer. Florean Fortescue’s Ice-Cream Parlor: They had some of the usual flavors found in any given ice-cream shop along with creatively designed ones such as Salted Caramel Blondie (which is what I went for), Earl Grey and Lavender, and so much more! I went into the shop twice, the first time simply to browse through their menu and the second time to actually buy myself a treat. When I went there the second time, it was more crowded because it was just after lunch and a lot of people had a similar idea of getting post-lunch dessert from this cute little shop. Hogwart’s Express: At this time after my ice-cream, I decided to get on the Hogwart’s Express and visit Hogsmeade which took almost an hour with the 45 minute wait and the train ride. The wait was worth taking the train. This was a faster way to travel to Universal’s Island of Adventures if you did not want to walk all the way out and re-enter the other park. The train ride had some really amazing special effects (as expected) to simulate the journey from King’s Cross in London to Hogwarts with scenery which was depicted on the window. Tip- Do make sure that your pass mentions that you can visit more than 1 Park in 1 day or they will not let you into the King’s Cross station. Hogwarts: This was the first thing my attention really went to upon exiting the Hogsmeade station. They actually have a themed ride inside the castle that I was not able to visit. The castle looms over in the backdrop. The town of Hogsmeade itself was ‘snow-covered’ and once again had a similar feel like Diagon Alley with the different Harry Potter soundtracks playing in the background. I had always imagined what the castle would probably look like and definitely did have an idea, but I was still awestruck with its size and construction upon actually setting my eyes upon it. 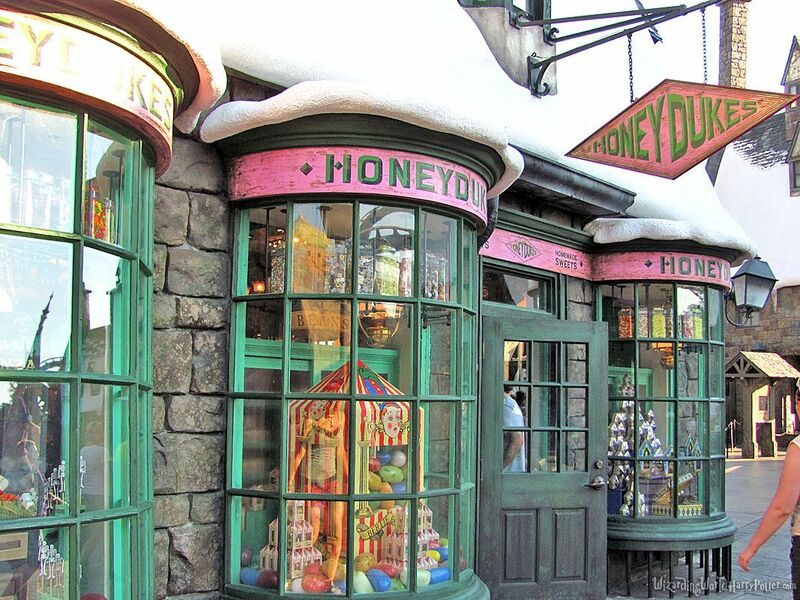 Honeydukes: They had all the famous candy mentioned in the book and even an attached bakery. I ended up getting a cauldron cake from the bakery but nothing from the shop itself. Honeydukes had a really cute feel and atmosphere to it along with being as colorful as in the movies. Hog’s Head: This joint was actually attached to the Three Broomsticks, where you could go for a meal. 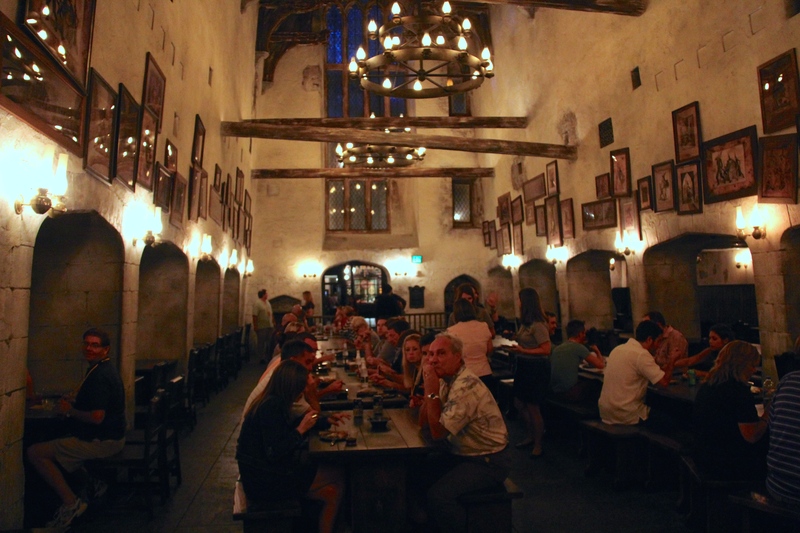 One could enter Hog’s Head simply to get a drink itself instead of standing in line at The Three Broomsticks entrance. I got myself another Butterbeer here. Unlike the first place where I got my Butterbeer (still non-alcoholic), Hog’s Head head other drink options such as draft beer. Visit this amazing places and get awestruck, just like i did ! !